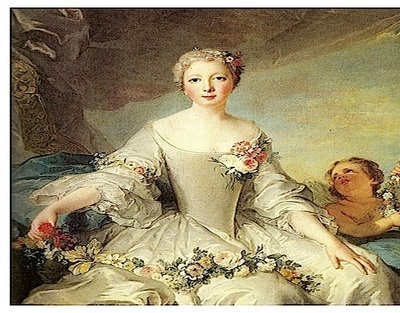 King Louis XV's parents. 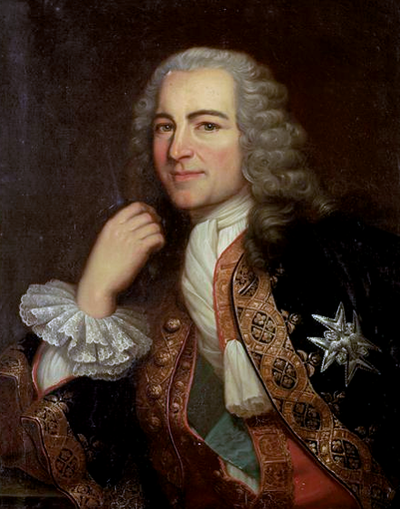 His father was the grandson of Louis XIV and the son of the Grand Dauphin, and was known for most of his life as the Duke of Burgundy. 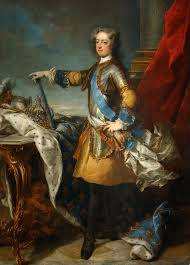 When his father died in 1711, he briefly became Dauphin and heir. 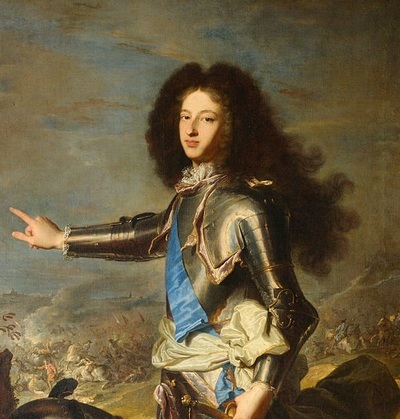 That is one fine head of hair / wig on the Dauphin. 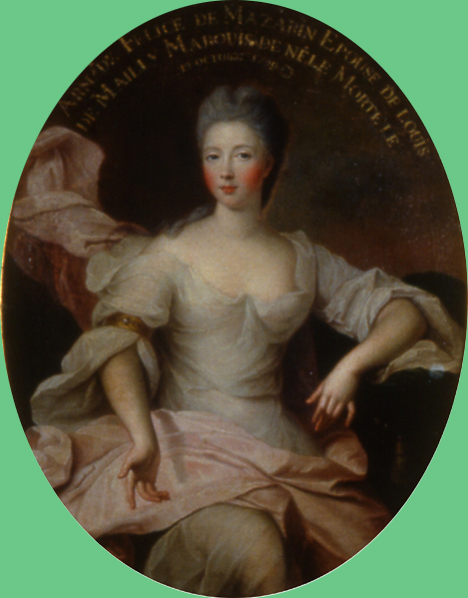 He married Marie-Adelaide de Savoy. 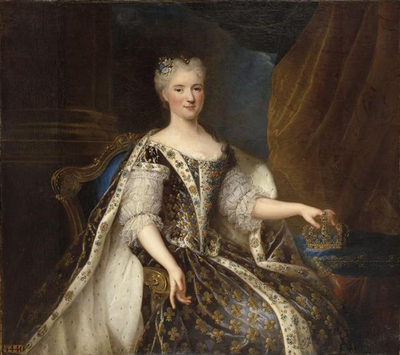 Their sudden deaths in 1712, along with their eldest son (Louis XV's elder brother), paved the way for Louis XV' ascension to the throne at the age of 5 in 1715. 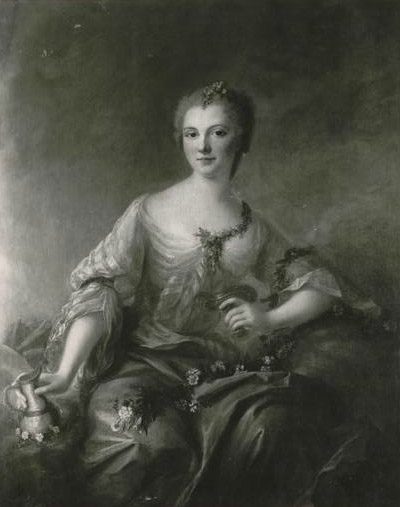 Queen Marie Leszczynska, Louis' long suffering Polish wife. 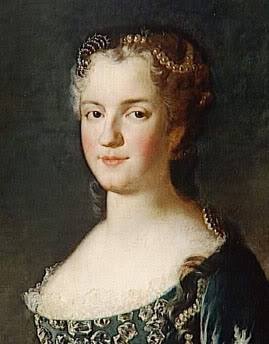 Mademoiselle de C harolais, in her younger years, looking very cutesy and sweet. Apparently she sometimes liked to have her portrait painted wearing the costume of a monk (middle), when she was feeling penitent. I can't really get my mind around how sacrilegious that feels! 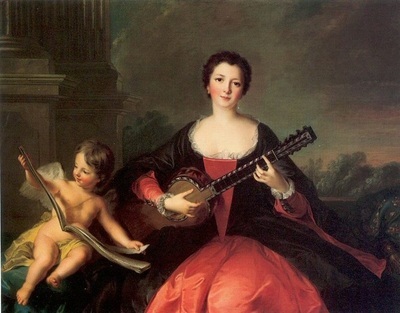 Two portraits of Armande Felice de la Porte Mazarin, the girls' mother and a grand-daughter of the famous Hortense Mancini (portrait on the far right). Sadly, the original color one of the black and white portrait in the middle doesn't survive (at least on the internet). 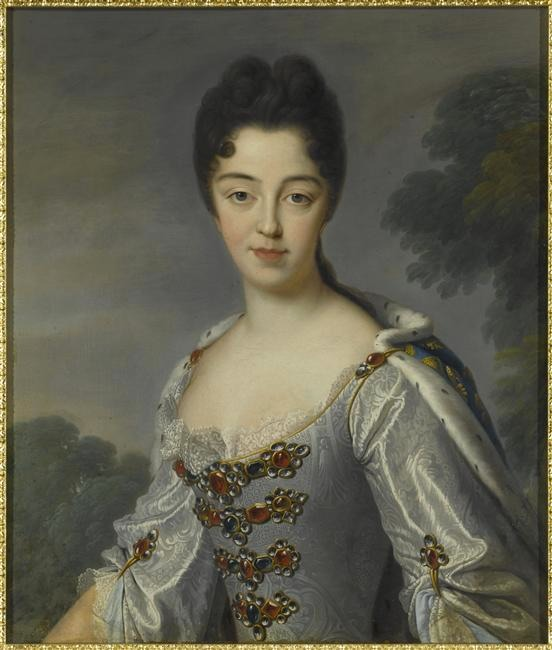 The earlier one, left, is inscribed: Armande Felice de Mazarin, épouse de Louis, Marquis de Nêle, morte le 1 octobre, 1729. 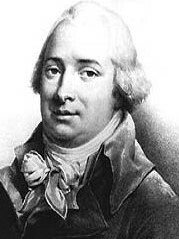 Philogene, the Marquis de Puysieux. Louise's first lover. What a good looking man! 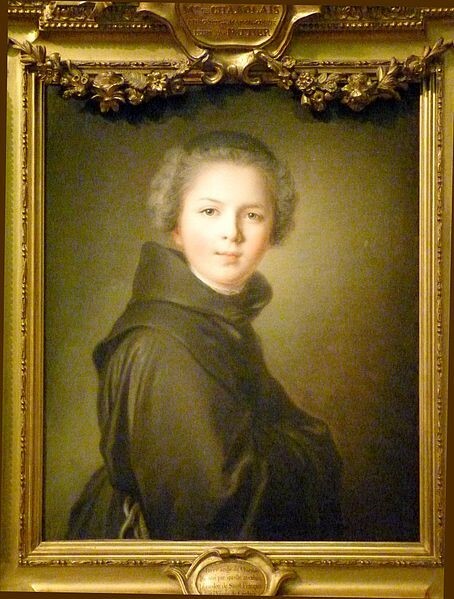 Cardinal Fleury, in his younger days. The "Marvelous Mathilde", not really a character in Sisters, but she does feature more heavily in the second book, The Rivals of Versailles. 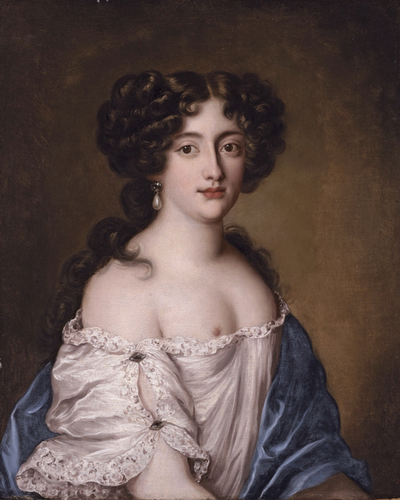 But wow, what a beautiful portrait! 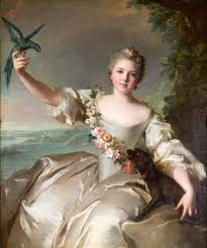 I saw the original at the fabulous Andre Jacquemart museum in Paris - I wasn't expecting to see it, and then suddenly, there it was! Stunning. 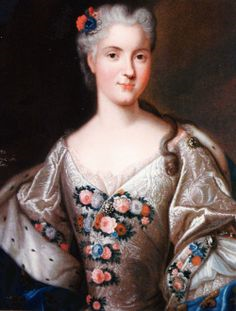 She was born in 1725 and married, when she was only 12, to the marquis d'Antin (a younger brother of Louise's friend Gillette, the Duchesse d'Antin's, husband). Her first husband died a few years later and then she married the Comte de Forcalquier. 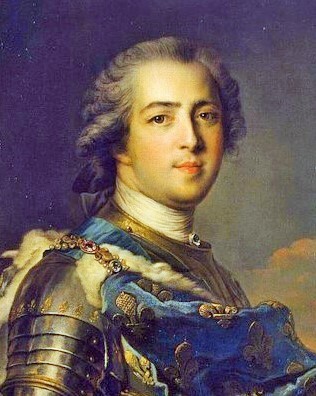 The duc d'Agenois, Marie Anne's lover. Hmmm. I'm sure he was better looking in his youth, and in person... 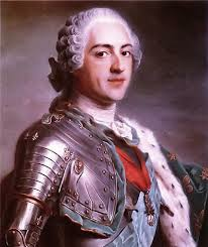 He later became the duc d'Aiguillon and was an important minister during the middle years of Louis XV's reign.